Franklin Perez continues to dominate teams in the Carolina League. Houston's No. 6 prospect allowed two hits and struck out seven over five scoreless frames in Class A Advanced Buies Creek's 14-1 victory over Carolina on Thursday. Perez, MiLB.com's reigning Pitcher of the Week, has surrendered only three hits in 14 1/3 innings in 2017. "Basically he did the same thing that he's done the previous two outings," Buies Creek manager Omar Lopez said. "Attack the hitters, use all his pitches, mix them up very well and elevate the fastball when he needed to put hitters away. He's pitched very well and has great command and all of that." The native of Venezuela retired the first five batters before surrendering consecutive singles to Troy Stokes Jr. and Max McDowell. He then put away the Mudcats in order over his final three frames, finishing with a strikeout of Weston Wilson. The decision to pull Perez followed a plan that was laid out prior to the game. "He'll go five innings or 75 pitches, whatever happens first," Lopez said. "That's part of our pitching philosophy and program. We have the tandem philosophy. Today, he was scheduled to go on a piggyback, and I think the next outing he should go single starter." A converted third baseman, Perez got a late jump on fine-tuning his secondary pitches, but Lopez sees a sharp improvement in the right-hander's slider and changeup that has led to success in his first experience in the Carolina League. 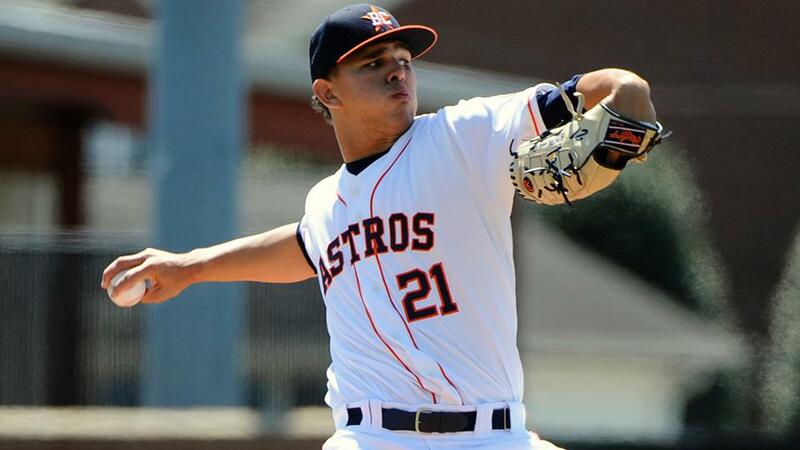 The 19-year-old is the second-youngest pitcher on the circuit, 41 days older than Salem starter Roniel Raudes. "That's one of the things that we realized probably a couple years ago about a guy that never pitched in amateur baseball too much, the way that he goes about his business," Lopez said. "He's very open-minded, he listens, he retains information, he's able to execute it and make the adjustments and he's very mature for his age. "That's a plus for a young kid like him and hopefully he can continue to develop his stuff. Also with experience, he's going to be able to soon pitch in the big leagues." Myles Straw went 3-for-5 with three runs scored and Ryne Birk tripled, singled, scored three times and drove in two runs. Osvaldo Duarte went 2-for-5 with four RBIs and is 9-for-17 in his last four games while No. 2 Astros prospect Kyle Tucker added a double, a single, two RBIs and a run. "Not because we scored a lot of runs, but overall our offense locked in with their approach. They were looking for their pitches and worked with strengths and not with a weakness," Lopez said. "We didn't chase so many pitches out of the zone, we didn't chase so many secondary pitches. "We were locked in waiting for our pitch and they were able to score the ball." Matt Bower picked up his first save after giving up a run on three hits with a walk and five strikeouts over the last four innings.